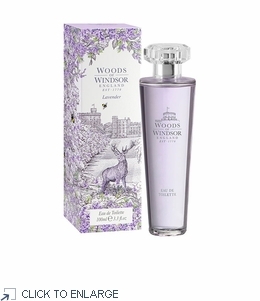 Woods of Windsor Lavender Eau de Toilette 100ml / 3.3 fl oz Natural Spray Lavender?s calming and relaxing scent and subtle English beauty has ensured that the fragrance has been firmly established as a classic. In this truly traditional English Woods of Windsor scent, the fresh green notes of the Lavender flower have been combined with notes of patchouli, musk and chamomile to create a fresh, aromatic fragrance. Made in England. Beautifully boxed; 100ml / 3.3 fl oz natural spray. 5060322950730 Dating back to the 18th century, Woods of Windsor is an aspirational range of luxury bath, body and home fragrance products that utilises the flowers, plants and essential oils that can be found in England's historical parks, gardens and stately homes. Inspired by recipes dating back to 1770, Woods of Windsor offers a range of innovative, high quality products, combining natural ingredients and modern technology. Lavender?s calming and relaxing scent and subtle English beauty has ensured that the fragrance has been firmly established as a classic. In this truly traditional English Woods of Windsor scent, the fresh green notes of the Lavender flower have been combined with notes of patchouli, musk and chamomile to create a fresh, aromatic fragrance. Beautifully boxed; 100ml / 3.3 fl oz natural spray.